Administrative professionals at the University of California systemwide are formally launching a campaign this week for union representation with UPTE-CWA. Rank-and-file organizers have been reaching out to their coworkers about key issues such as wage increases, job security protections, preserving pension and health benefits, and say they want to join 80,000 other UC employees who already have union protections. “I strongly feel that we need union representation to ensure that we have parity with other UC employees regarding wages, benefits, and working conditions.” You can see other administrative professionals' comments here. 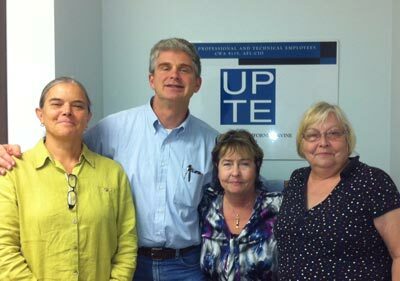 UC Irvine Administrative Professionals say "We support UPTE!" UPTE's supporters are collecting “authorization cards” which will be given to the state's Public Employment Relations Board in support of a union election. If you are an AP, look for your card in the mail this week. All APs and their supporters are invited to kickoff events this week. Contact UPTE if you'd like more cards to give to your coworkers. Public-sector employees around the nation rely on union representation to bargain collectively during the difficult economy. In New York this week the Public Employees Federation reached a tentative agreement with Gov. Andrew Cuomo that will preserve thousands of jobs.. Meanwhile, the National Association of Letter Carriers is trying to find alternatives to the U.S. Postal Service’s plans to lay off 120,000 workers in order to save money, hiring former Obama adviser Ron Bloom, who successfully helped shore up the auto industry in 2009. The union representing faculty at the University of Illinois-Carbondale is planning to walk off the job on November 3 unless a contract settlement is reached. Issues include academic freedom, tenure and the right to teach courses without the administration's interference. A new study out from UC Berkeley's labor center shows that budget problems across the nation are due to the recession and the crash of the housing market — not public sector workers and their unions. In fact, compensation for public-sector workers (including both pay and benefits) has declined as a share of state expenditures – to 20 percent in 2009 from 23 percent in 1992. The Monday Memo is edited collectively by a group of UC administrative professionals who are working for union representation with UPTE-CWA. We publish most Mondays, unless it is a university holiday, or we just need a mental health day off. We welcome your submissions, either credited or anonymous, at mondaymemo@upte-cwa.org. Please feel free to forward this memo to your colleagues. Anyone may subscribe to the Monday Memo by sending an email to subscriptions_mondaymemo@upte-cwa.org. You will only get one email a week from the Monday Memo on this list, and may unsubscribe at any time. If you are a UC administrative professional you have the opportunity to sign an authorization card to say you want to represented by UPTE. All administrative professionals are also welcome to become members of UPTE, with all the associated rights and benefits.